Attending this month in Bologna a public conference of presentation of a book on the recent political Italian developments that led to an end Mr. Berlusconi’s cabinet and the raise of the one led by Mr. Monti, Prodi has been provoked instead to answer also on the Ukrainian crisis. And he gave a statement rather rare to hear nowadays in the Italian and European media. Namely, in his opinion it has been wise that at the time of his cabinet Italy, France and Germany rejected the possibility of Ukraine joining NATO. Also, as Ukraine is a natural geo-political bridge between the European Union and Russia, it should not belong exclusively to any of the two, but rather help to establish stronger ties between the West and the East. Any other radical option would lead to tearing apart the country with disastrous consequences. Finally, Prodi concluded in front of an audience made of some of the traditional Bolognese inteligencija – that it was for him a reason of disappointment to see that Europe had lost its momentum in the current management of the Crisis, playing clearly a secondary role to the Americans and Russians. One may say that this position is rather logical and inevitable. However, it has un-doubtfully a stronger value coming from a man that has been the head of the European government and that is traditionally known for his critical positions towards an excessive USA predominant international role, which has led him to rather cold relations with Ms Ashton, the current EU High Representative for Foreign Affairs. And yet, despite the rather balanced and constructive statement, nevertheless the real news is that not only other commentators and institutional representatives in Europe have poorly followed it – but also that Prodi’s words have received very little coverage in the western and Italian media. Not to mention that the European Commission has not even formally commented them. Instead, we have been pushed to listen as a daily mantra to the rather predictable and arbitrary statements of the current EC President Mr. Barroso, almost impossible to distinguish from those of the NATO Secretary General Mr. Rasmussen. This has provided yet another evident confirmation of what seems to be the western communication strategy in recent times, a sort of upgraded re-edition of a war of Propagada 2.0 – where the bar has been raised from simply supporting the official statements to the more sophisticated level of ignoring and hide to the larger public opinions those analyses that have the only sin to be objective, not interest driven and therefore not functional to the rhetoric of the “us” against “them”. 502: 30 seconds to mars. 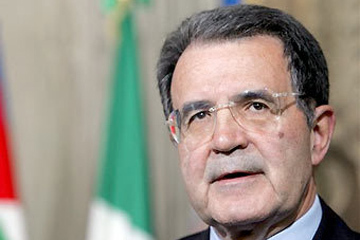 Prodi 2.025 March 2014: Prodi 2.0!